The Daibutsu of Tōdai-ji (a Kegon Buddhist temple in Nara, Japan). A representation of Vairocana. Vairocana is one of many Buddhas revered by particular sects of Sino-Japanese Buddhism, especially among the Chinese school of Hua-Yen, and the Japanese schools of Kegon and Shingon. The Buddha Vairocana represents the embodiment of Dharmakaya ("Truth Body"), and therefore is often depicted in massive sculpted images and stone carvings. The largest of the famous Buddhas of Bamyan, for example, was a representation of Vairocana Buddha thereby conveying the largeness of his teachings. In Sino-Japanese Buddhism, Vairocana is also seen as the embodiment of the Buddhist concept of sunyata or Emptiness. Derived largely from the teachings of the Mahavairocana Sutra and to a lesser degree the Vajrasekhara Sutra, Vairocana is not to be confused with Virocana, who appears in the eighth chapter of the Chandogya Upanishad as the king of the Asura. Over time, the worship of Vairocana in East Asia was gradually superseded as an object of reverence by Amitabha Buddha, due in large part to the increasing popularity of Pure Land Buddhism, but Vairocana's legacy still remains in the Tōdai-ji temple with its massive bronze statue and in Shingon Buddhism, which holds a sizeable minority among Japanese Buddhists. 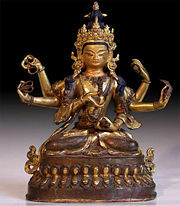 Eighteen/nineteenth century Indo-Nepali Style gilt and painted figure, distinct in its six-armed form, which illustrates the embodiment of the Six Perfections that are the practice of a Bodhisattva. In the Rig Veda scripture of Hinduism, the word ‘vairocana' has the connotation of a brilliant and luminous sun. Correspondingly, Vairocana in Tibetan is called ‘Namnang' (rnang.par snang.mdzad), meaning ‘the illuminator', and the Japanese 大日 (Dainichi) translates as "Great Sun." The doctrinal foundation for the meaning of Vairocana Buddha is found in the Mahayana Buddhist teaching of the Trikaya (meaning, "Three Bodies of the Buddha"). The Dharmakāya (lit. Truth Body or Reality Body) is a central concept in Mahayana Buddhism forming part of the Trikaya doctrine that was first expounded in the Saddharma Pundarika Sutra (The Lotus Sutra), composed in the first century B.C.E. It constitutes the unmanifested, inconceivable aspect of a Buddha according to which all 'phenomena' (Sanskrit: dharmas) arise and to which they return after their dissolution. Unlike ordinary unenlightened persons, Buddhas (and arhats) are said not to die (though their physical bodies undergo the cessation of biological functions and subsequent disintegration). In the Lotus Sutra, Buddha explains that he has always and will always exist to lead beings to their salvation. This aspect of Buddha is the Dharmakaya, which may be considered the most sublime or truest reality in the Universe. Vairocana is an idealization of this central function of the Buddha as a teacher, without which there would have been no Buddhism, and no path to enlightenment. While Amitabha Buddha is seen as a personification of Compassion (balanced by Wisdom), Vairocana is often seen as a personification of Wisdom. In the Buddhist Mahavairocana Sutra, Vairocana teaches the Dharma to Vajrasattva, but it is utterly incomprehensible, so Vairocana provides esoteric techniques and rituals to help conceptualize the Dharma beyond verbal form. It was this sutra that prompted the Japanese monk, Kukai to journey to China to learn more about Tantric Buddhism. In Vajrayana Buddhism, the Five Dhyani Buddhas (Dhyani ध्यानि Skt. for "concentration"), also known as the Five Wisdom Buddhas, are representations of the five qualities of the Buddha. The term "dhyani-buddha" is first recorded in English by the British Resident in Nepal, Brian Hodgson, in the early nineteenth century, and is unattested in any surviving traditional primary sources. 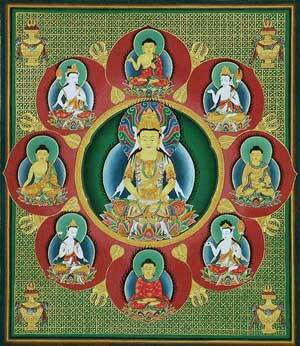 These five Buddhas are a common subject of Vajrayana mandalas. The Wisdom Buddhas are all aspects of the dharmakaya or "reality-body," which embodies the principle of enlightenment. Initially two Buddhas appeared which represented wisdom and compassion—they were, respectively, Akṣobhya and Amitābha. A further distinction embodied the aspects of power, or activity, and the aspect of beauty, or spiritual riches. In the Sutra of Golden Light, (an early Mahayana Sutra), the figures are named Dundubishvara, and Ratnaketu, but over time their names changed to become Amoghasiddhi, and Ratnasaṃbhava. The central figure came to be called Vairocana. In the conception of the Five Wisdom Buddhas of Vajrayana Buddhism, Vairocana is at the center. The Five Wisdom Buddhas are protected by the Five Wisdom Kings, and in Japan are frequently depicted together in the Mandala of the Two Realms. There is an expansive number of associations with each element of the mandala, so that the mandala becomes a cipher and mnemonic visual thinking instrument and concept map; a vehicle for understanding and decoding the whole of the Dharma. Each of the five Buddhas first identifies a specific human failing and then helps us in transforming it into a positive attribute, bringing about the spiritual evolution required for enlightenment. An image of the Hyōgo Daibutsu depicting Vairocana in Kobe, Japan. Significantly, Vairocana is said to be the sum of all the Dhyani Buddhas and combines all their qualities. He is therefore, pure white, since white is a blend of all colors. Indeed, his lotus seat is supported by a pair of two great lions. The lion is considered to be the king of beasts and when he roars all others fall silent. Similar is the roar of Buddha's teachings, in relation to the grandeur of which all other voices of our everyday life become insignificant and fall silent. Not surprisingly, meditating on the image of Vairocana is specifically believed to transform the delusion of ignorance into the wisdom preached by the Dharma. When Gautama Buddha turned the wheel of the Dharma, it illuminated (like a sun), the hearts of men and women darkened by ignorance. Correspondingly, Vairocana's distinguishing emblem is the golden or solar wheel. 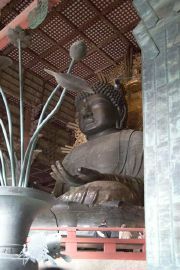 The Vairocana statue in Nara's Tōdai-ji in Japan is the largest bronze image of Vairocana Buddha in the world. The larger of the monumental statues that were destroyed at Bamyan in Afghanistan was also a depiction of Vairocana. Vairocana Buddha is often depicted in sculpture using the Dharmacakra mudrā symbolizing the Wheel of Dharma. This mudra represents one of the most important moments in the historical life of the Buddha, the occasion when he preached to his companions the first sermon after his Enlightenment in the Deer Park at Sarnath. It thus denotes the setting into motion of the Wheel of the teaching of the Dharma. ↑ During the initial stages of his predication in Japan, the Catholic missionary Francis Xavier was welcomed by the Shingon monks since he used the word Dainichi for the Christian God. As Xavier learned more about the religious nuances of the word, he changed to Deusu from the Latin and Portuguese Deus. The Buddhist monks also realized by that point that Xavier was preaching a rival religion. This page was last modified on 14 January 2016, at 15:59.